I started with four thick pieces of raw Norwegian salmon fillet. Into these I rubbed some Maldon sea salt (what else) and freshly ground black pepper, then coated with extra virgin olive oil. 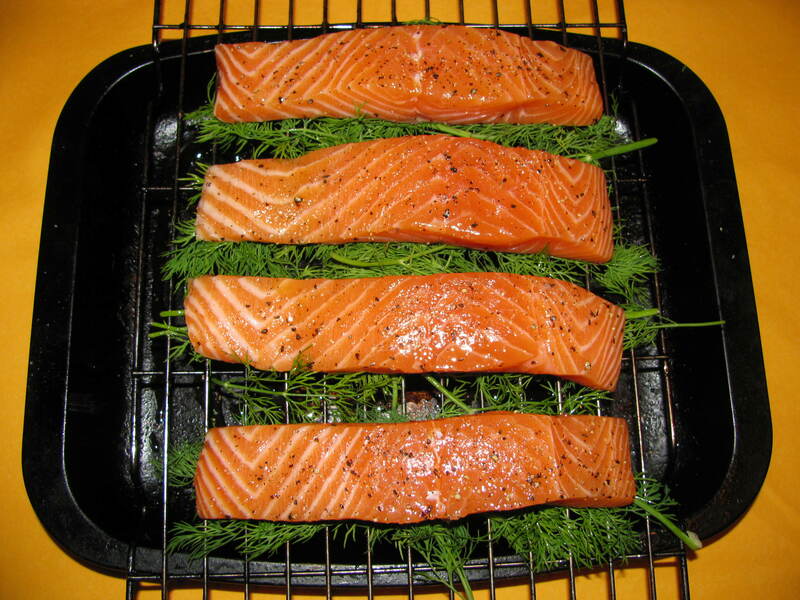 I placed the fillets each on a small bed of fresh dill and then upon a wire rack, over an oven dish filled with water. I got a fire going, starting with wood and then moving onto coal briquettes. To provide some smokey flavour, I managed to get hold of some oak wood chips. These chips are made from old whiskey barrels and rather unsurprisingly, they have a strong whiskey smell which works brilliantly with salmon. 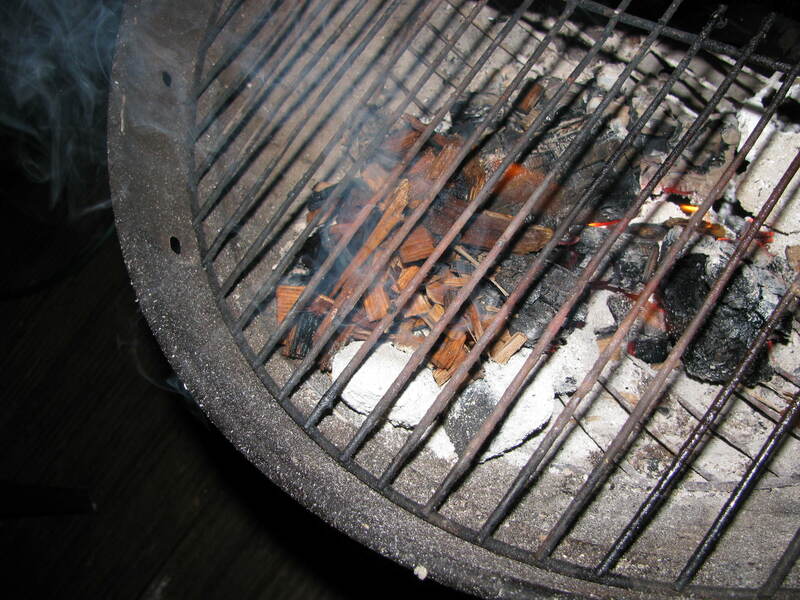 Before using them, they must be soaked in water so that they smoke, rather than burn, when put on the coals. 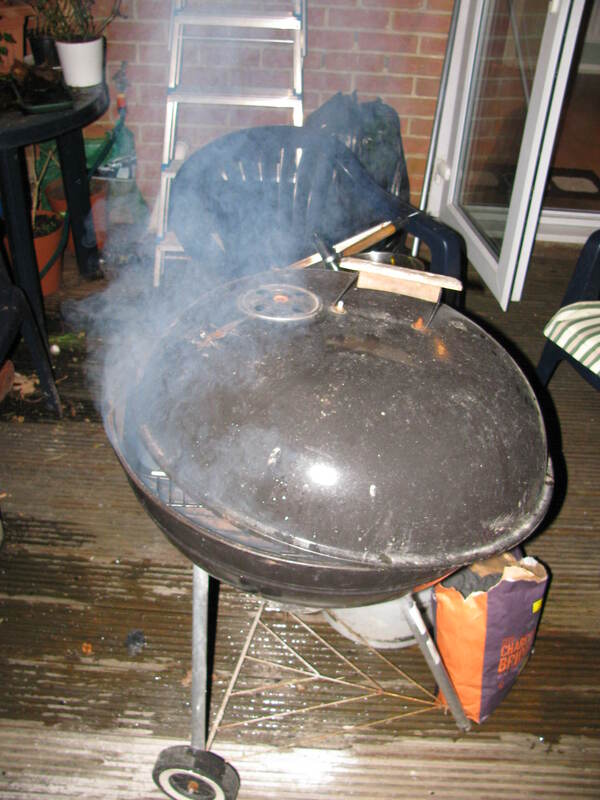 I find it’s best when smoking food in a barbeque to cook it over indirect heat whenever possible – that way you get the maximum smokey flavour as it cooks a lot slower and more uniformly. My favourite way to do this is to place whatever’s to be smoked on a wire rack over a dish of water. I baked the salmon on a bed of fresh dill this way until almost cooked, then basted it Thai sweet chilli sauce for an Asian twist, then returned to the heat for another few minutes until just cooked (don’t overcook! The salmon should be slightly pink in the middle). 1. Methode Cap Classique is the method whereby sparkling wine is made through secondary refermentation in the bottle, prior to reumage and degorgment, all done by hand. This is exactly the way Champagne is made in France, where it is referred to as Methode Champenoise but for legal reasons the MCC term is used in South Africa instead. MCC wines can be truly amazing and at their best, every bit as good as their French counterparts. The art itself was originally brought to South Africa by the French Hugenots, the very first MCC wine being Simonsig’s Kaapse Vonkel, a wine still made in Stellenbosch to this day. My person favourite is High Constantia’s Clos André – rich and intense, made by winemaker Dave van Niekerk. His special Close Andre Reserve is still the best sparkling wine of any type that I’ve ever tasted! It looks great, Gary. 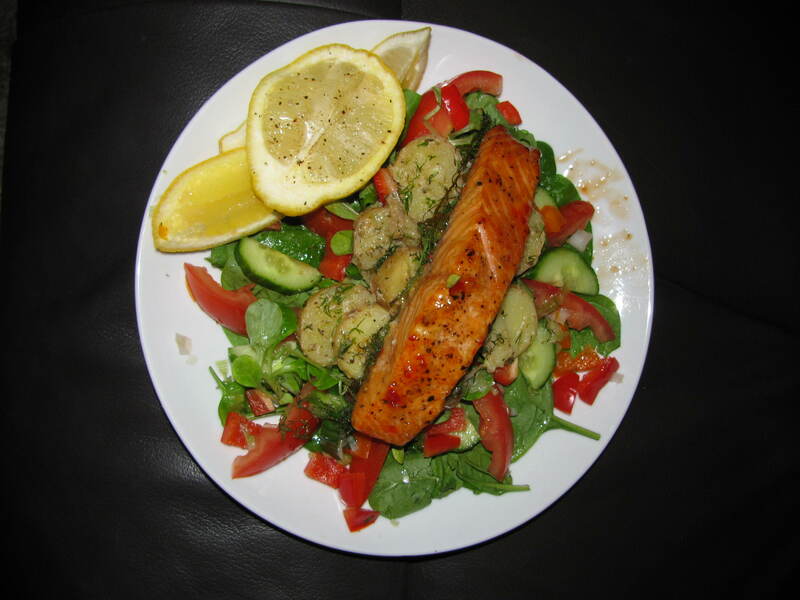 Have you tried smoking salmon over Rooibos tea leaves? Thanks, Cindy! I must admit that I’ve never tried using Rooibos (or “Redbush”, as they call it here in the UK) to smoke anything. Does the end product taste of Rooibos at all? It’s almost treason for a South African like me to say this, but I’m not the biggest fan of Rooibos. I recently had a Rooibos Dom Pedro when I was in SA last month and while it was good, I couldn’t help feeling it would have been nicer with a shot of coffee! That looks wonderful, and oh so very Scandinavian-inspired! How long do you smoke the pieces of that size, approximately – I’m tempted to try this come next summer! Hi Veronika, thanks for the kind words! I smoked these for approximately 20 minutes at a guess. 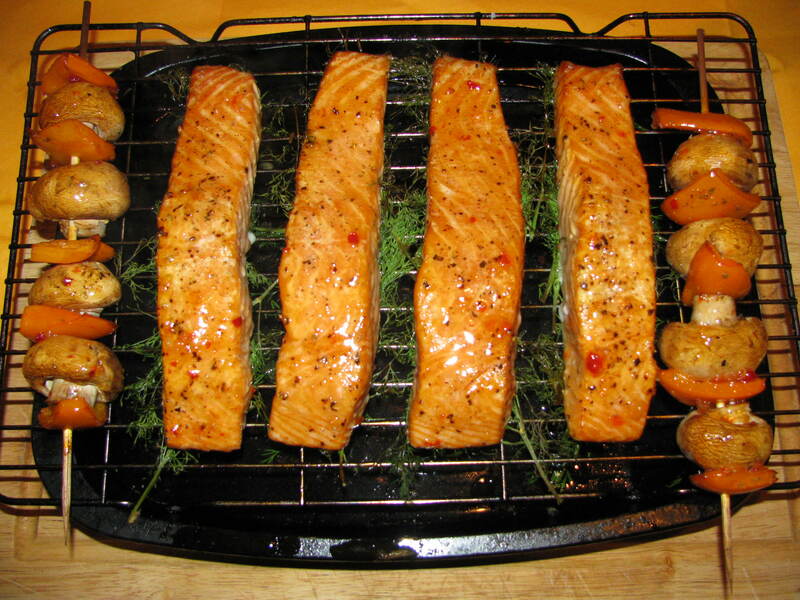 As this form of smoking is “hot” smoking, the aim is really to cook the fish as if it were in an oven, rather than rely on the smoke to preserve the fish as in cold smoking. I would say the cooler you can keep the oven / barbeque (ie. the longer and slower you can cook the fish), the more smoke flavour you will get and the more it will penetrate the fish (the dish of water is crucial here). If it helps, I was very happy with the amount of smoke flavour in the fish and I used about one coffee mug of wood chips, soaked in hot water, as a single addition to the fire. Your mileage may, of course, vary depending on what type of wood chips you use. It’ll be a good 6 months before I can try this, but the wood I have on hand is rosewood – cut off an old rose bush (we are talking tree-sized bush), and cured for a couple of years. Will get one of the resident vikings to chip it and use it on a large stationery grill we have. 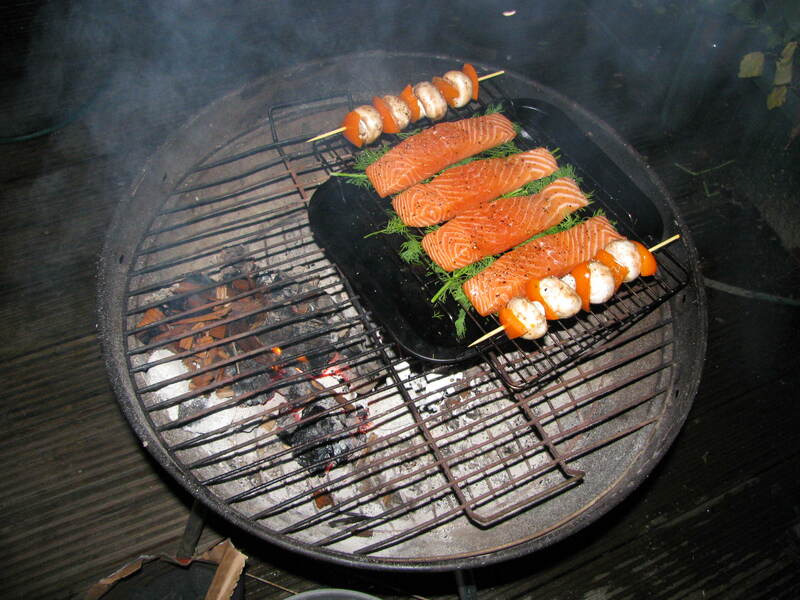 May have to figure out something to cover it with, as it’s lidless – but, desire for smoked fish is the mother of invention!